surface. Each unit features these shelves. Standard 4" x 2" mold-on-rubber casters, 2 rigid, 2 swivel. Built of durable steel or aluminum construction. Steel units and ladders are powder coated a blue finish. 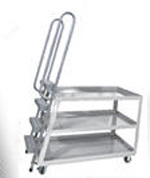 Specs: shelf clearance 13"; top shelf height 35-1/2"; capacity per shelf 330 lbs; total capacity 500 lbs. Available in 22"W x 52"L, 28" and W x 52"L platform size.